The age wave is rising and when it hits 19% of our population will be aged 70 or above, more than half of us will work in the public sector, and 60% of our income will be paid in taxes to finance our future. How can we prepare for such a massive wave of change? What if it were possible not only to prepare for but to ride it? I 1905, when King Haakon became the first monarch in modern Norway, life expectancy was near 50. Today it is more than 80. According to SSB, the life expectancy of Norwegian women will be 90 by 2060. We will then have twice as many seniors (67+) as we have today, compared to the rest of the working-age population. 2060 might seem far off, but the age wave will strike long before that time. 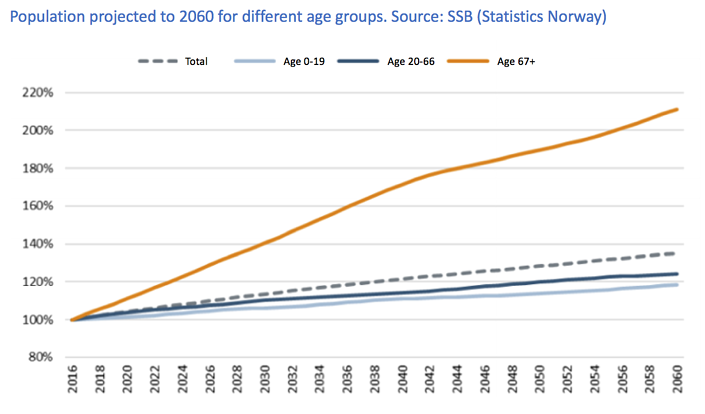 The diagram below, taken from a Menon Economics report, shows SSBs expected age wave impact. The impact of the age wave will be keenly felt in the health sector. The share of the national workforce employed in the public sector is expected to rise from 27 percent (2014) to 45 percent in 2060. Specialist health services will employ about 300,000 people – a 260% increase over 2013. If this prediction turns true, marginal tax rates will exceed 60%. Is this a sustainable path? Can we make smarter investments in the health sector, work more efficiently and at the same time ensure that the, so-called, "warm hands" remain a part of healthcare for consumers? The Menon report shows that the challenge lies not so much in increasing efficiency - for the Norwegian health sector is much more efficient than it used to be. The problem is that the effect of efficiency gains is being diluted by "insufficient investments in new technology, equipment upgrades, building maintenance, etc." It’s the technology and how we organize around it that I want to focus on in the remainder of this blog post. The Internet of Things (IoT) has caught on in the consumer market. Parents are giving children smartwatches equipped with SIM-cards and GPS receivers, which in turn are connected to a mobile app on parents’ smartphones. A clever invention that provides convenience for both parents and children and the feeling of security. As a mother, you know where little George is, and where he has been. You can even enable geo-fences that notify you should he move outside a radius you specify. Your child always has the security of being able to call mum or dad, send audio messages and, in cases of emergency, push an SOS-button that calls up family members in a sonically discrete manner. It saves family both time and worries - and best of all: It is easy. Our expectations that technology will better enable us, protect us and serve us are increasing. Increasingly, we hold the health sector to the same standard. Just as importantly, we continue to expect warm hands in health care and uncompromised quality of health service offerings, if not improved, and hope to have such affordably as our populations both increase and age dramatically. Isn’t this, however, to expect that we can have our cake and eat it too. Can we? Yes, is my firm belief. We can if we invest more in smart health technology. There are significant potential savings in utilizing smart technology to predict and prevent injuries before they happen. For example, a municipality will save greatly if it can help citizens avoid hip fractures. 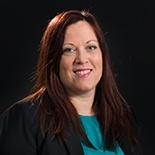 The municipality of Halden has taken measures to solve several increasing problems: - the early discharge of patients, the increasing number of seniors, and lack of available hospital beds. The municipality now offers patients the opportunity to be admitted to their own homes with an equally level of patient care. 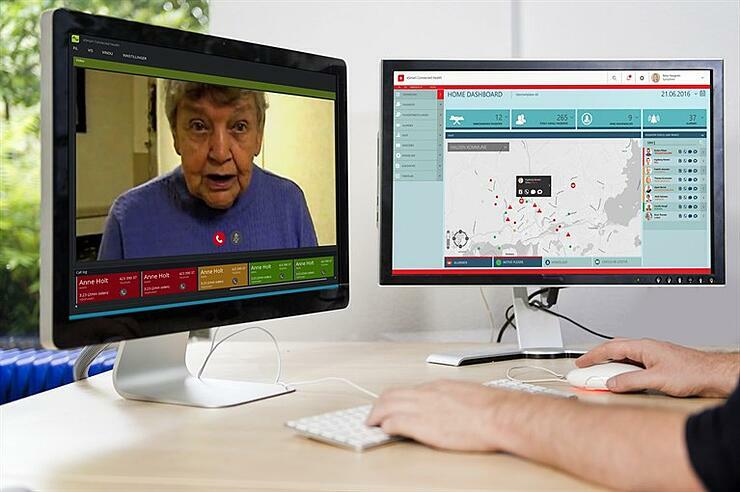 Patients are equipped with a security alarm and a tablet, which enables video communication with health professionals 24/7. A response center has also been established to route and handle patient alarms. On average 9 out of 10 alarms are false. With the use of video, health professionals can clarify if a home-visit is necessary. In many cases, questions and needs can be solved remotely. In time, the solution will be extended to include monitoring patient parameters like pulse, blood pressure, blood sugar, respiration, etc. By pairing this data with data from the home (i.e. power and water consumption), things begin to get interesting. It makes it possible to detect characteristic medical value patterns like blood pressure and blood sugar levels, and quickly take the right action when some values are outside the typical range for that specific person. If Edith (73), one morning wakes up with a low blood pressure, and the system reports that she has not used the hot tap water nor switched on a light, an automatic notification is sent to the response center triggering the home nursing care unit to contact Edith via the tablet or home-visit. In the case of an Alzheimer patient or patients with a similar diagnosis, it’s possible to monitor the GPS position of the patient and set up a geo-fence where the response center or the patient's family are notified if the patient leaves their home in the middle of the night. The age wave is coming and it will prove tough to tackle. However, the sooner we implement small and smart initiatives to utilize technology, sensors, Big Data, Artificial Intelligence, and machine learning – the better equipped we will be for the future. Maybe we will then be able to ride the wave and both have and eat our cake as we do.